The early Adelaide bookseller Charles Platts was the publisher of this satirical newspaper, printed by George Dehane. The text was probably written by Nathaniel Hailes, a well-known Adelaide auctioneer who used the pen name 'Timothy Short' in letters to the press from as early as 1839 (Southern Australian, 24 April 1839, p. 3). 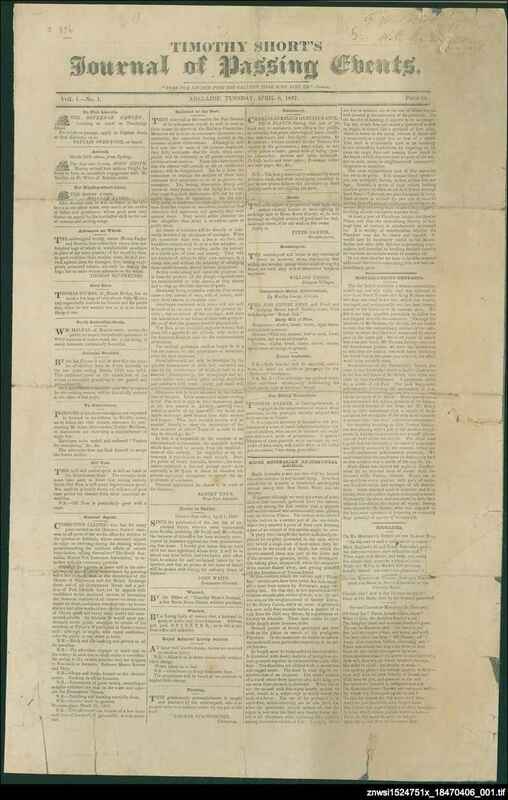 In 1841 Hailes edited the Adelaide independent and cabinet of amusement - the first illustrated newspaper in Australia. Unfortunately, the newspaper was reportedly forced to close due to a libel charge. In Timothy Short's journal he writes, 'Timothy alone greets thee in these columns' (p. 2). The humour in Timothy Short's journal largely consists of puns. All the usual columns found in a newspaper of the time - editorial, shipping column, courts, proceedings in parliament, letters to the editor and advertisements - are included, but in a satirical format. The Burra mines, defence and a recent agricultural show are topical items which are mentioned, as well as mild jokes directed at William Ashton, the governor of the Adelaide Gaol (p. 2). It is possible that two later newspapers published by James Allen of the Adelaide times are a continuation of Timothy Short's journal - or were at least inspired by it. These are titled: Adelaide gazette extraordinary or South Australian toddy, and First of April cracker or South Australian wasp.